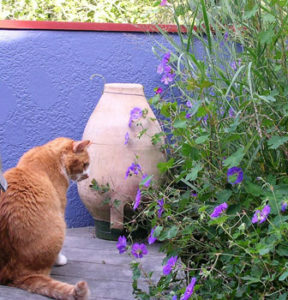 My cat loved to watch hummingbirds. Hummingbirds love Cape Fuchsia for the nectar. 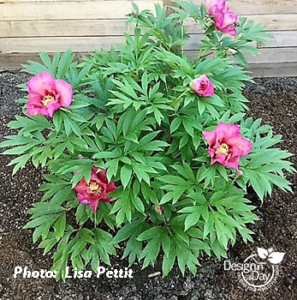 I love to use it in designs because it adds so much color, is easy to grow and the new varieties work well with modern and cottage garden styles. 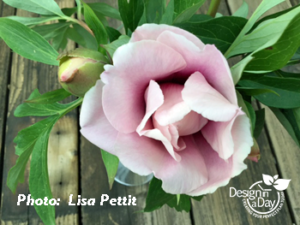 This plant is a crowd pleaser and I use it frequently. I planted my first Cape Fuchsia, Phygelius x rectus ‘Salmon Leap’ on my roof garden in Portland’s West Hills. It was at 900 feet and we had snow every year. The house was designed so that the third floor master suite had easy access to and a view of my roof garden. It had a hot tub that was 20 feet from my bed, a big overstuffed outdoor sofa with an overhead cover and plenty of Cape Fuchsia! In spite of the colder winters, the Cape Fuchsia (native to South Africa) never flagged or failed in the 12 years I lived there. I loved my roof garden and the only family members who loved it more were the 4 leggeds, Barley, Cee Cee and Cracker Jack. One particular day everyone was curled up on the sofa. I was reading and pets were napping. All was peaceful. I heard a strange whirring noise. At first I didn’t see anything unusual. Out of the corner of my eye I saw my pets’ heads were going up and then down and then up, I saw a small blur. What was happening? We were witnessing a hummingbird mating ritual. The male made a 90 foot oval flight pattern to within an inch of his intended. She was steadfastly ignoring him and drinking nectar from my Cape Fuchsia. There wasn’t even a flicker in his direction. The buzzing sound was made by his high speed downward trajectory. It abated on the way up. It was mesmerizing. It was one of those beautiful summer garden memories that I treasure. Just us mammals all watching the entertainment together. If you would like to have some close encounters with hummingbirds or you just love colorful plants, the Cape Fuchsia is the perfect addition to your garden. The best hummingbird attractors are the older varieties because they flower in the most intense coral red shades. My favorites are ‘Devils Tears’, ‘Salmon Leap’ and ‘African Queen’, but they are too big and a bit too rowdy for a small yard. The new varieties are more compact and a little tidier in habit. The flower colors are available in more traditional flower petal shades. When these new colors first came on the market I was annoyed. I felt like they had dumbed down a great plant by removing the coral shades…….but then I saw it wasn’t an either or. I now had more choices and that is always a good thing for a garden designer. If you love modern landscape design style but don’t want to give up color, these new Cape Fuchsia are perfect because they are smaller. They look great in a mass. Skagit Gardens’ Croftway Purple Prince is an intense magenta. Phygelius Aequalis ‘Croftway Purple Prince’ has that intense magenta color. I think it looks really good with Black Mondo Grass………Morticia Adams where are you now? It glows in the evening light. ‘Croftway Purple Prince’ is cold hardy for the Pacific Northwest and listed as zone 6 Yah! 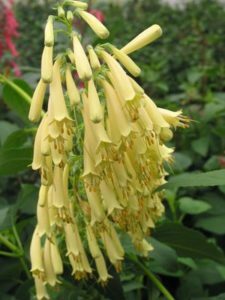 Phygelius Aequalis ‘Croftway Yellow Sovereign’ is 18 to 24 inches tall by 24 inches wide. Many plants with soft yellow flowers burn in full sun but ‘Yellow Sovereign’ can take the sun and heat. 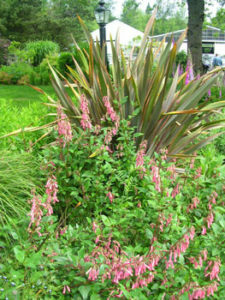 Barbara Ashmun, Portland garden writer has a great article about Cape Fuchsia’s. 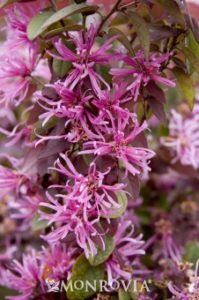 I don’t tend to use the older varieties of Cape Fuchsia in front yards as the winter appearance is too ragged without a major trim. If you love this plant like I do, simply cut it to the ground in mid December for a tidy look. People who like a very tidy landscape may want to pass. It will seem too messy for them. Phygelius planted along side Phormium. 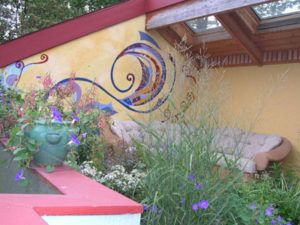 Picture from ANLD garden tour. 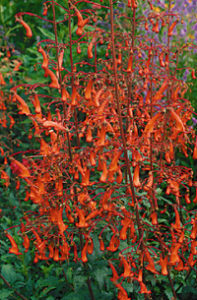 Cape Fuchsia, Phygelius, is a colorful, low maintenance long blooming summer flower for the Pacific Northwest. 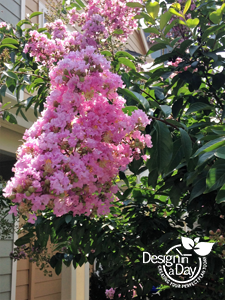 I use it in landscape designs for clients who love color and watching hummingbirds. It’s a personal favorite of mine. If you are a person who wants a very tidy landscape that looks perfect all year long, this is not your plant. I consider this plant to be low maintenance. The winter appearance is not tidy but clients who love the color and the show simply cut it to the ground in December. It can spread some. In the spring if the plant is taking more territory than you want, simply pull on the stem that is straying. Pull it out of the ground and cut the root off near the mother plant. It is very easy, I promise. 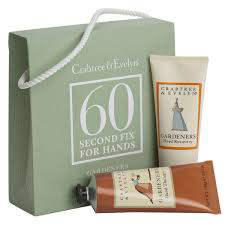 Give it lots of sun, decent soil and water the first year. It will need less water the following year. Some clients water it about once every two weeks. By the way, there is nothing wrong with needing a calm and low maintenance landscape. 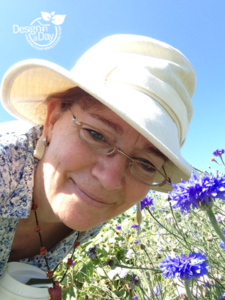 We are all unique and a plant that makes one person feel delight can make another person feel claustrophobic. 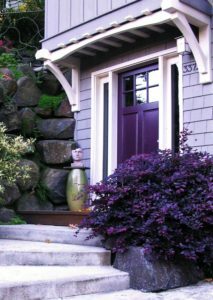 I notice clients who grew up in climates where plants tend to be sparser can feel uncomfortable with the full flush of plantings possible here. Mass planting of strong plant colors and a path help to break up the lines of the pool. The first time I used this plant was for Art and Linda in SW Portland. They had a 1960’s swimming pool in the backyard that dominated. It visually ate the backyard. They wanted a cottage garden style with lots of color. My design solution successfully put the pool in a subordinate position to the landscape. I created some great paths and shapes for the planting beds that broke up the lines of the pool visually. We needed masses of strong plant color in the backyard to offset the powerful aqua rectangle. 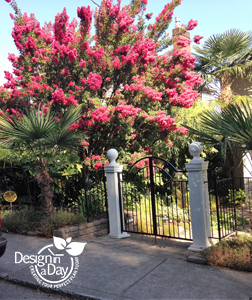 I’m not a big color wheel garden designer but colors like coral and salmon are opposite the wheel from aqua. The Cape Fuchsia flowers are perfect for this situation because they flower in these colors and they flower all summer, hitting their stride during hot weather. My clients enjoy hanging out by the pool and are entertained by the antics of hummingbirds. Hummingbirds are strongly attracted to the hot coral red tones of the Cape Fuchsia. Art and Linda’s back yard needed some color to offset the aqua of the pool water. My favorite planting combination for this design was Panicum Virgatum, American Switch Grass ‘Heavy Metal’ with the Phygelius x recta ‘Devils Tears’. They are a perfect contrast combination! The Switch Grass blade is a fine silvery blue texture. 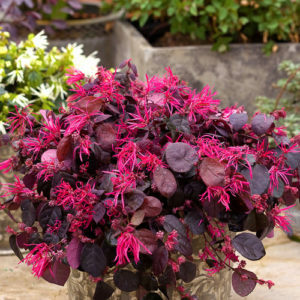 It contrasts with the Cape Fuchsia’s dark green leaf and hot colored tubular flowers. The inside of the tube is a mellow lemon yellow but mostly the hummingbirds are the ones who see this. 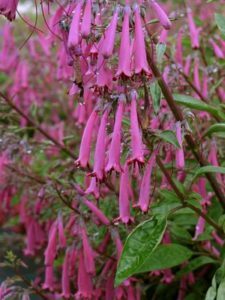 If you research this plant on the internet, you may think Cape Fuchsia are not cold hardy here since they are native to South Africa. Many plant authorities also say these plants need a lot of water. I don’t agree. I have grown them at 900 feet on a roof garden and only watered them every two weeks. They were successful for 12 years and were still there when I moved. I’m always advocating for low water use so planting Cape Fuchsia with American Switch Grass results in a very low water landscape pairing. While I love the old fashioned varieties, the new varieties are shorter and flower in softer more traditional colors. This has made the Cape Fuchsia a more versatile plant that works well for small properties and containers. The only drawback to the new varieties is the softer colors. When you select a softer color you lose some of the hummingbird magnet effect but you still get a great plant. 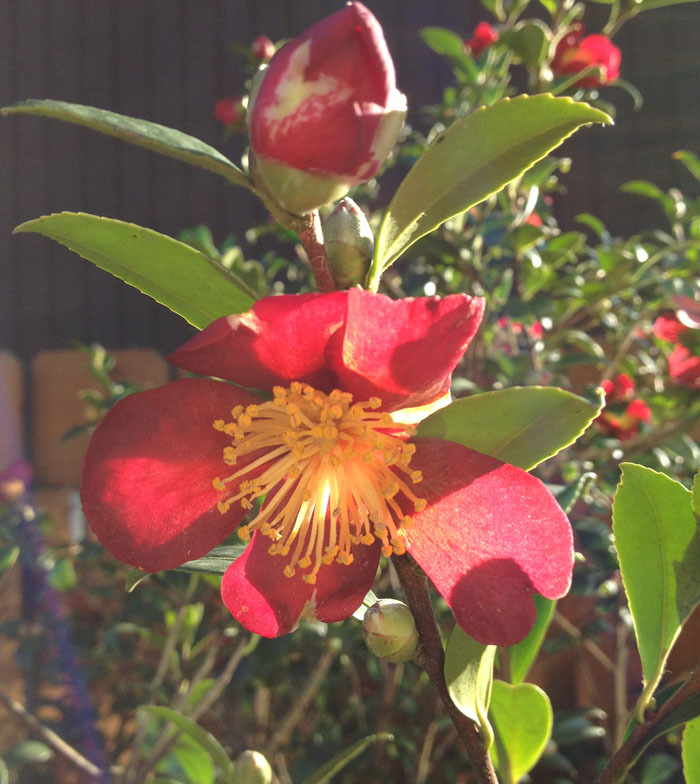 Check out other great hummingbird plants.